The Law Society 2018 Pro Bono and Community Service Award Presentation Ceremony was successfully conducted on 12 December 2018. We were very honoured to be graced with the presence of The Honourable Chief Justice Geoffrey Ma and The Honourable Secretary for Justice Teresa Cheng. The 2018 Pro Bono and Community Work Recognition Programme (“2018 Programme”) was well supported by members and law firms with over 180 applications, from which a total of 29 law firms and 155 lawyers received awards. Apart from the Individual and Law Firm awards (Gold, Silver and Bronze), a number of distinguished awards including the Distinguished Pro Bono Service Award, Distinguished Community Service Award, Distinguished Pro Bono Law Firm Award and Young Lawyer Special Award were presented. Two new awards, namely Award for Elderly Service and Improvement Award were introduced this year to respectively encourage members and law firms to contribute in serving the elderly, and to participate actively in pro bono and community work whenever they can. The awardees of the Distinguished Awards were selected by the Judging Panel comprising Professor Alfred Chan, Chairperson of Equal Opportunities Commission; Mr. Lester Huang, Past President of The Law Society and Ex-officio member of The Hong Kong Federation of Youth Groups; Mr. Thomas Kwong, Director of Legal Aid; Mr. Tony Lam, Deputy Privacy Commissioner for Personal Data; Ms. Connie Lau, The Ombudsman; Ms. Ada Leung, Director of Intellectual Property; Ms. Gilly Wong, Chief Executive of Consumer Council; The Hon Rimsky Yuen, Former Secretary for Justice; President Melissa Pang and Ms. Serina Chan, Council member and Chairlady of Pro Bono Committee. 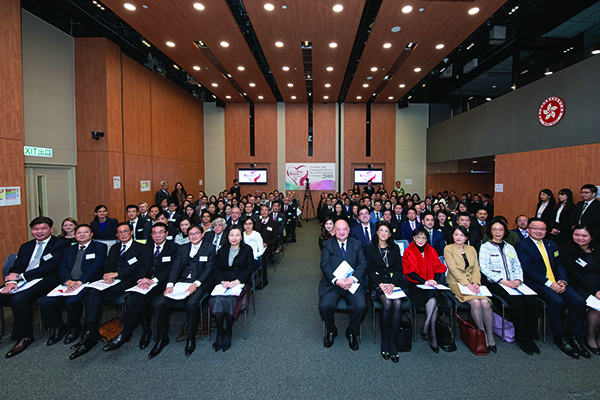 For the list of 2018 awardees and awarded law firms, please visit the website: http://www.hklawsoc.org.hk/pub_e/probono/news.asp. Chief Justice Geoffrey Ma (top) and Secretary for Justice Teresa Cheng (bottom) delivering the speeches. All the guests and participants at the ceremony. Our Honorable Guests with some members of the Judging Panel. The law firm representatives received the Distinguished Pro Bono Law Firm Award. Winners of the Distinguished Pro Bono Service Award – Mr. Eric Cheung (top photo) and Mr. Chang Jonathan Karmen (bottom photo). Mr. David Luk (middle) was presented with the Young Lawyer Special Award and Award for Elderly Service. Representative from Daly & Associates received the Award for Elderly Service. Mr. Chak Man Lai (first from left), Mr. Sebastian Ko (second from left), Ms. Winnie Wat (third from right) and Mr. Lam Chi Yau (first from right) received the Distinguished Community Service Award. Awardees of the Improvement Award.